Don’t worry if you don’t have any idea about cooking beef jerky in the dehydrator. 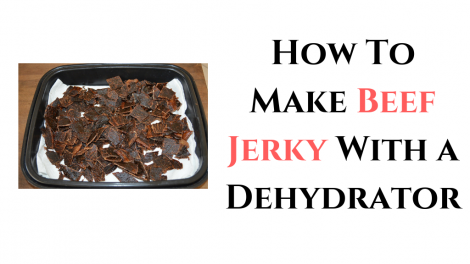 In the below article, we will provide you the step by step instructions of preparing the beef jerky in a dehydrator along with some useful tips. Take a 2 lb lean meat’s piece, like Bottom Round, Flank Steak, Eye of Round, Top Round, Sirloin Tip, etc. The objective is to get a meat’s piece which comprises of little fat as the extra fat can spoil and decrease the shelf life of the beef jerky. You might also use a jerky gun and ground meat. Now, take out the fat cap as well as other noticeable fat through the piece of jerky meat. Put the beef jerky inside the refrigerator for around 1 to 2 hours to moderately freezing so that you can easily cut the even slices of the meat. The beef jerky meat must be stiff to touch but do not freeze t completely. Now, cut the slices of the jerky against the meat’s grain for about 1/8 inches to 1/4 inches thick so that the jerky become chewable later after drying. Alternatively, if you have a jerky slicer at home then, you can skip the step of freezing. The jerky slicer ensures that the entire strips of the meat are cut with a similar width so that they all get dehydrated uniformly. After the slicing of the meat, keep it all aside. Now you have to prepare the marinade. Mix all the ingredients like soy sauce, Worcestershire sauce, brown sugar, onion powder, garlic powder, black pepper, salt, ground coriander and water in a ziplock bag or a bowl. Now, add the cut strips of the beef in the bowl and uniformly cover it with the marinade on all the slices. Now, keep the marinated beef in the refrigerator for around 8 hours which is enough for the delicious tasting jerky. It is good if you can keep the marinated slices for the longest time. Subsequently, the marinating, trench and pat dry the strips of jerky for eradicating any extra flavoring before drying. It benefits in speeding up the process of dehydration. Now, it’s time to use your food dehydrator. Put the strips of beef jerky over the shelves of the dryer machine. Don’t forget that the strips should not overlap or touch each other. It is essential that you leave some space among the slices so that proper air can circulate between them during the drying process. Turn ON your food dehydrator and fix its temperature at 160° with the time of 4 hours. The internal temperature of the jerky must reach a temperature of 160°. The beef jerky might take 5 hours to dehydrate. The time for dehydration also depends on the thickness of the slices you cut earlier. You should check the beef jerky during the drying procedure to evade the problem of over drying. If the jerky cracks or bends but does not get break partially then, it means your drying process is over. After the completion of dehydration, allow it to cool down for a few hours. So, now your dried beef jerky is ready. You can store it in the glass jars, vacuum sealed bags or ziplock bags. This dried food will remain good for around 8 to 10 days in the ziplock bag but for storing the beef jerky for longer duration like 1 or 2 months, the vacuum sealed bags are preferable. Never over dry the beef jerky meat. The primary objective of drying meat in the food dehydrator is to eliminate the entire moisture from the meat. Thus, always keep an eye on the drying process. If the meat gets brittle then, it shows you have elongated the drying process. Ziplock bags are quite crucial for marinating the meat without the contact of excessive air. Remove extra fat from the meat and try to pick the lean meat. The fat can make your meat rotten even if you prepared it in the right way with right seasonings. Freezing of the beef jerky meat is significant. After taking out the extra fat from the meat, keep it inside the freezer for some time for letting it harden up. It will benefit you in making your cutting procedure easier afterward. Weigh your jerky before and after trimming the fat. The weight that we have given in the article is before trimming, and also the ingredients are measured accordingly. So, if your quantity of the meat decreases, adjust the number of ingredients consequently. So, if somebody asks you how to make beef jerky with a dehydrator, we hope that you have an answer to give after reading the above info. Homemade dried beef jerky is an excellent snack for mid-day hunger, camping, hiking, and family get-together without distressing about freezing or cleaning utensils. You can carry the dried beef jerky along with you on backpacking adventures or long road trips. It is not a protein-packed snack but also provide good fuel to your body. It is much cheaper than the market bought beef jerky snacks. You can prepare it at any time of the day as it needs very less time for preparation. Which flavors do you like to include in your recipe of beef jerky? Please let us know in the below comment box. If you have any experience reading the cooking of dried beef jerky in a dehydrator then, don’t hesitate to share it with us. Stay tuned for more informative upcoming blogs on our website!